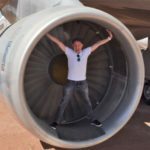 I wrote an article a while back on how to combat jet-lag, listing some of the factors that affect it. One that I didn’t mention was oxygen levels. The amount of oxygen in the air you breathe is crucial to how drowsy you feel and, as a result, how much jet-lag you feel. But why would the type of aircraft affect the amount of oxygen in the cabin? To understand why, we must first delve into a bit of engineering. Fortunately, you’re speaking to someone who studied aeronautical engineering at university! Here we go… The main difference between 787s and A350s is that they’re made from composite materials (e.g. carbon fibre). The big benefit of this is that they have the same strength as their predecessor, aluminium, with 20% less weight. This means they use less fuel. Hence they are popular with airlines, who are all budget conscious. But another key difference is that, unlike aluminium, they don’t stretch. This means more air can be pumped into the cabin without putting stress on the fuselage. A plane will always suffer somewhat from air escaping the cabin (this is minimal), but carrying more air means more oxygen and a lesser pressure difference, meaning more comfort (e.g. less ‘foot swelling’ or ear popping). Another way of visually demonstrating this would be to see if a sealed water bottle ‘crinkles’ as it does on other planes. This is also due to pressure difference between the inside and outside of the bottle. Just a little bit of avgeek trivia for y’all. Next time you’re flying on a redeye, if a 787 or A350 is available, you’ll know what to book. And it could make all the difference to your sleep schedule. Have you ever noticed a difference in jet-lag when flying on a dreamliner? Wow – I just flew on my first 787 with Norweigan Air and although I didn’t really sleep much on the flight from LAX to London (I never do) I CAN’T BELIEVE how quickly I’ve adjusted to the 8 hour time difference, in fact I don’t think I’ve experienced ANY jet lag and have barely noticed the time difference!! I’ve made that flight about 100 times in my 17 years living in London. Wow!! !